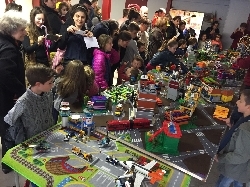 WARRENTON, Mo., Nov. 8, 2018 /Standard Newswire/ -- The international ministry Child Evangelism Fellowship (CEF) is using models built of LEGO® bricks as a tool to build community relationships with families while teaching children the Word of God. The CEF workers partner with local church volunteers by providing the popular building blocks, figures and instructions so the children can create a variety of buildings and vehicles, and by teaching the Bible program. The local church provides the helpers to sit and build with the children.